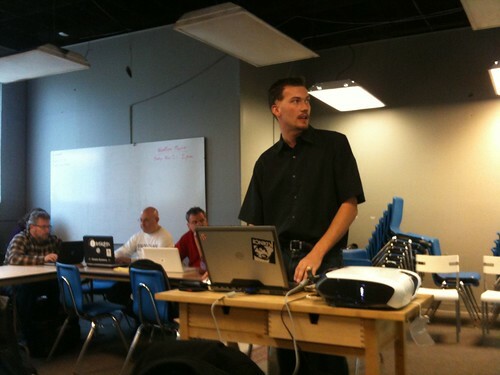 I launched this as a support site for a local WordPress user meetup group in Ferndale, MI in 2009. Over 3.5 years and 34 meetups (and 3 successful WordCamps!) later, the group is going strong thanks to current organizers. The group has outgrown its name, and the name has been changed to Metro Detroit WordPress Meetup group. To match that, the URL of this site is now changed to metrodetroitwp.wordpress.com with the site title change. I want to thank Deborah, TJ, Anthony, and Debra for running the community and growing it so much after my leaving of the area in 2011. You guys are awesome! And of course, make sure to join the meetup group’s next event! Although I’ve moved quite far (Tokyo, Japan), I am looking forward to joining the local meetup or WordCamp someday in the future. Today at our November meetup, we were delighted to have Russell Fair from Atlanta WordPress Developers & Designers Meetup Group and Atlanta WordPress Users Group. He covered a wide range of relatively new WordPress features with great examples from his past and current work. Video recording for his presentation will be published here soon & Russell will be sharing his notes later on. You can subscribe to this blog from the sidebar “Email Subscription”, or follow us on Twitter @ferndalewp for updates! If you see my Meetup.com profile, I am listed as an organizer of the MBS WordPress Meetup group (MBS = Midland, Bay City, Saginaw). But the “actual” organizer there is Nick, who is my coworker at Automattic. Anyways, he posted that he’s planning the first meetup at the end of March. If you know anyone around there who may be interested, please help spread the word. And if there are any friends or families up there you visit, you might want to check the MBS WordPress Meetup calendar (feeds are available too) to see if they have any meetup when you are nearby. In our last meetup, Anthony Montalbano (@italianst4) gave us a presentation on “The Power of Plugins”. The plugins he mentioned are listed is at Room3064.com, and titled “24 WordPress Plugins to extend WordPress beyond a blog“. Everyone enjoyed hearing Anthony’s first-hand experience in using some of the popular plugins and other lesser-known yet useful ones. You can read descriptions and reviews about plugins, but sometimes it’s much more helpful when you can ask questions and compare usages. I have a short video from this but it’s not ready yet. Coming soon… Update: Posted the video. After the presentation each of us shared a couple of plugins that we like. I’ll just list them with a short descriptions. TinyMCE Advanced: Extend the default Visual Editor – e.g. insert tables, and control WordPress formatting. After the Deadline: Everyone’s favorite proofreading plugin 🙂 The developer Raphael Mudge was at our December meetup and gave a talk on this. Yet Another Related Posts Plugin: Smart and extensible related posts plugin. WPML Multilingual CMS: Helps build a multilingual content site. Though it’s not a plugin, Press This was also mentioned as a very useful tool (FYI: Noel Jackson, another speaker from our past meetup worked on this!). If you don’t have it yet, go to the “Tools” panel on your WordPress dashboard. You can strat using it right away. For March meetup, Tim will talk about some WordPress shopping cart solutions, and Trevor will shocase a non-profit organization site he worked on with Tim. I will post the date & details on the meetup site soon. Today’s Ferndale WordPress Meetup had a nice turnout. I was happy to see lots of new people. I am trying to schedule our meetups on more regular basis (same time, same week on every month). i3Detroit is a possibility (maybe after March) but let me know if you have any suggestions about the location. Please join the Meetup.com group to get all updates about upcoming events. I also post things on Facebook and Twitter (@naokomc) time to time. First, Trevor presented “Developing a WordPress Theme“. I posted the summary of it as another entry. 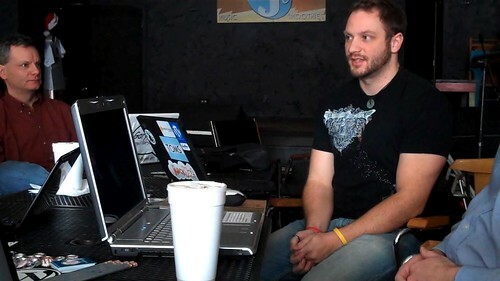 Then we talked a little about WordPress 3.0. WordPress MU merge is going well and a “pre-preview release” is coming soon. There will be a new default theme called “2010” replacing Kubrick. You can read more about it on WordPress.org development blog’s entry 2010: A Theme Odyssey. The project schedule for 3.0 is on WordPress Development Updates blog. For the latest updates, check that blog often. Currently, 3.0 release is scheduled for mid-April. More new stuff: improved menu management, custom post type, core plugins… lots to look forward! There were some questions about WordPress Foundation. The site explains its mission and purpose, but in short it’s a non-profit organization for open source WordPress projects. You can go to the site to check out the new default theme “2010”. The site is using a beta version of the theme. Some of us are planning trips to WordCamp Toronto and WordCamp Chicago. There is a discussion thread on Meetup.com message board about it, so post comments if you’re interested. Gary says get the ticket soon if you’re planning to go, because last year Chicago ticket got sold out quickly. 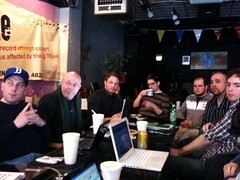 We are also going to kick off our WordCamp Detroit 2010 planning. If you are interested in volunteering or getting updates, please contact me. Speakers, sponsors, spreading the word – any help is appreciated! When I have more specific information, I’ll make sure to post it here.